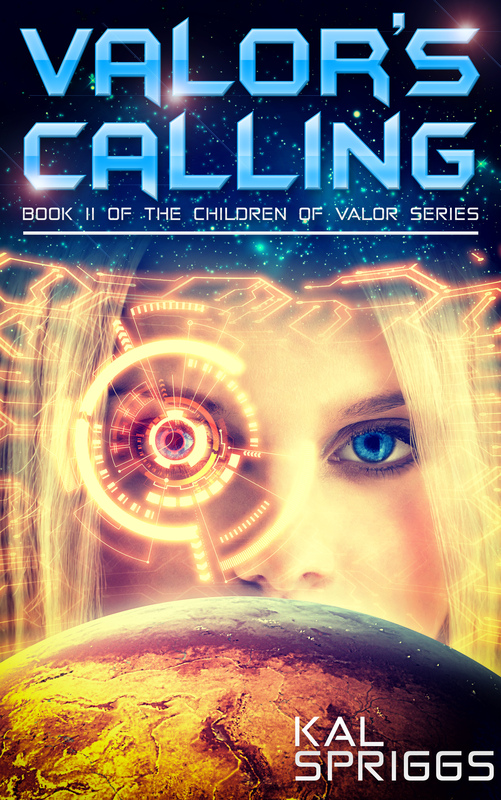 Valor’s Calling is now available from Amazon! Here’s the third and final snippet for Valor’s Calling. You can find the first two here and here. Valor’s Child is available today from Amazon! The Enclave was weird. As we drove through it, I couldn’t quite put my finger on it. The buildings were all squat and low to the ground, vehicle garages were all underground. It wasn’t a big city, or at least it didn’t seem to be. That was, right up until Karmazin drove down into what looked like an oversized garage… and the road kept going. I craned my head around in surprise as I saw that the road descended into the ground, winding deeper and deeper. “Who are you defending against?” I asked. “Anyone who might attack,” Karmazin hedged. It was a vague enough statement to make me feel uneasy. I’d heard that Enclave citizens were prohibited from service in the Century Planetary Militia by a recent Charter Council decree. Was that because they felt the Enclave was some kind of security risk? For that matter, if there is some kind of fight, which side would Karmazin pick? I knew they were refugees, from the Three Day War with the Dalite Confederacy. I hadn’t expected them to have defenses or for their aerospace port to look so militarized. Karmazin pulled into a side street and then into a vehicle garage. He climbed out, “I’ll help you out with your bags,” he offered, moving to open the cargo compartment. He cocked his head at me, “You’re sure?” There was something in his voice, almost an edge of disappointment. I wasn’t going to think about that, though. “Yeah,” I forced myself to smile. “I’ve got a lot of the pre-class assignments to knock out.” That wasn’t a lie. I still had several papers to write and three more books to read. I hadn’t even started the military ethics research paper itself yet, in part because I felt like it was sort of pointless. I had seen there was an evening flight. I had no idea if they had any seats left, but I was going to the aerospace terminal regardless. I’d spend the night there if necessary. “Well,” Karmazin said, “I’ll give you the quick tour, then.” He gave me a solemn nod, almost as if I’d hurt his feelings. Well, he probably should have thought of that before he started dating my best friend. I banished the thought before I could go on. I wasn’t going to resent my friends. This wasn’t their fault. I was the one who’d changed her mind. I was the one who had been wrong and I couldn’t expect things to be the way I’d secretly dreamed they’d be. “This way,” Ashiri said, leading the way. I followed them through the door. Alexander Karmazin’s home was far more spartan than I’d expected. There was a small dining room, a smaller living room, both with a few simple prefabricated tables and chairs. There were a couple of decorative holoprojectors, which painted two of the walls with vistas of a rainy, lush planet. I thought I recognized the pattern as one of the default settings, one that most people typically replaced with some kind of custom display. A tall, dark-haired woman greeted us as we stepped inside. She have Ashiri and I both nods, “Ashiri, welcome back.” Her gray eyes locked on me. There was something watchful there, evaluative and somehow threatening, as if she didn’t know what to make of me. “You must be Jiden Armstrong. I’ve heard quite a bit from Alexander about you.” She had the same olive skin, the same quiet watchfulness as Alexander, I saw. “It’s a pleasure to meet you, ma’am,” I said. “Yes,” Alexander’s mother said. I wasn’t sure if that was agreement with what I’d said or simply an acknowledgment. “Alexander tells me that you’ll be staying for a few days?” Her voice almost sounded resigned. “That’s too bad,” Alexander’s mother replied. She somehow managed to make that sound both sincere and insincere at the same time. I didn’t know if that was because she really didn’t want me here or if she somehow realized why I didn’t want to stay. Either way, I was eager enough to take that as a way to make my exit. “Of course,” Alexander said. He was looking at his mother though, almost as if he sensed something was wrong. I had no idea what was going on, but I felt like leaving was going to be the best thing I could do. All I wanted to do was get out of there and I think Alexander was really regretting the invitation to visit. I felt like an idiot, but I managed to say polite things as I backed out and Alexander gave me a ride back to the terminal. I passed the trip in silence. Thankfully, he didn’t seem very talkative, either. A few hours later I’d boarded a commercial skimmer and had my datapad out while I worked on some of my projects. I’d been lucky to get a ticket on the flight, the only one leaving the Enclave that day… but I’d scrapped my plans of staying with Karmazin and his family. Not with his relationship with Ashiri. I’d managed to message the Admiral to let her know I was coming a few days early, just before I boarded. Now I was buried in work. Some people hated to work on a flight, but I welcomed the chance to tune everything out, to not think about how my expectations had been completely overturned. The skimmer was surprisingly empty for a holiday season flight. It made me wonder if Karmazin’s people celebrated Christmas… or for that matter, if they celebrated off-season from everyone else. After all they were from another world. I knew there were some Christian and Jewish sects that followed the standard Earth twelve month calendar, in spite of the fact that it didn’t remotely match up to Century’s fifteen month years and three seasons. My mind went off on a bit of a tangent, sort of wandering as I stared out the window. I watched the hydrogen-powered gas turbine, just sort of staring at the heat distortion from the jet wash. It was mesmerizing and I just sort of watched as the superheated gasses blurred the setting sun and desert. I had a perfect view of the missile that came streaking in at us. My eyes went wide as I realized what I was seeing. But by the time I could open my mouth to shout a warning, there was a flash of light and the entire skimmer shuddered. The detonation was muted, but the skimmer went into a spin. I heard shouts and screams from the other passengers and the whine of the turbines altered pitch. The smooth flight became a rough spin and I was smashed against the side window. Staring out, I had a great view of the burning engine as the skimmer cork-screwed towards the ground. I’m going to die. The thought wasn’t as jarring as it should have been. I’d nearly died several times. It just seemed unfair that I’d survived being shot down and attacked by criminals, only to be shot down in a commercial aircraft. There wasn’t time to panic. There wasn’t time to do much of anything. I found my hands going to my seat restraints, tightening them, even as I heard the skimmer pilot come on over the intercom, “Brace for landing, brace for landing,” his voice sounded abnormally calm and some absent part of my brain wondered if he was a graduate of the Century Military Academy. The remaining engine roared as the pilot fed it power. The skimmer stabilized and the nose swung up. I watched the spinning sky and sand transition to mostly sand and some sky. This side of the aircraft was lower, the damaged engine providing little or no lift. The sandy, rocky ground whipped past, far too fast for me to pick out details and far too close for me to focus on it. We hit, a bone-jarring, grating, sliding, and world-ending chaos. Passengers and their possessions flew through the compartment. Something heavy struck me a glancing blow to the head and I saw stars. I saw the skimmer engine ripped away and then a moment later we smashed, hard, into something and the entire craft jerked to a halt. I unbuckled my restraints and stood. Passengers looked around dazedly. An attendant fumbled with one of the doors up front, but I didn’t see the attendant here near the rear. I pushed past my seat-mate and moved to the door, moving on impulse. The skimmer was damaged, the hydrogen tanks were probably leaking. We had to get off the craft before the hydrogen caught fire or exploded. Passengers started to move. Some fumbled with their restraints and I hurried to help them, pushing them towards the door. I didn’t want to think about how little time we had. Hydrogen gas would be spreading through the aircraft. All it would take would be a spark and the entire skimmer would go up like a bomb. I pushed and shoved at people, even as I heard a whoosh. The sound turned into a roar and I felt a wash of heat, even as I stumbled away. The dusk turned bright as daylight and I looked back to see the entire aircraft engulfed in flames. “Go!” I shouted angrily at people as they stopped to gawk. We weren’t anywhere near a safe distance away. I helped an attendant to herd people away from the crash site and the roaring flames. We’d managed to get two hundred meters away when the hydrogen tank exploded like a bomb. As the blast knocked me to the ground, I finally gave up and just stayed down. A moment later another hydrogen tank detonated, then the third. I lay on the ground, listening to the roaring flames and the panicked shouts of the people around me. Someone shot at me… again. There was no reason that I thought of myself as the target, but somehow I knew that I must be. Someone had fired a missile at me. They’d nearly killed dozens of people… trying to kill me. As I lay on the hard, hot ground, I had a dread certainty that they wouldn’t stop until they succeeded. Ghost Star Wants You… To Leave Reviews! Hi everyone, Ghost Star has been out for almost a month. As such, it’s time for me to pester my faithful readers to please leave a review! Amazon, Goodreads, wherever you prefer… even just emailing me to tell me you hate it. For those of you who purchased it (and I know you’re out there, I’m seeing the sales) please leave a review. I read them all and I take what you all say into account. This is a growing universe and your feedback helps me to improve as a writer.